The engine skid plates for the '87-'95 Jeep YJ Wrangler are available for both the 4 cylinder and 6 cylinder engines. 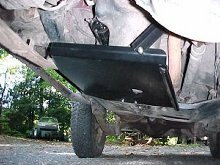 Skid Row engine skid plates require no modifications and are designed to work with or without a suspension lift. This gives you the protection you need when you're starting out with a stock height vehicle that puts your oil pan closest to the rocks. And when you're ready for that 3-4" lift, there's no need to modify your engine skid plate or get a new one. These skid plates are made of 3/16" thick steel and are powder-coated semi-gloss black for a durable and attractive finish. They mount solidly to the Jeep's frame and are specially designed for easy bolt-up installation with no drilling. All that you need are simple hand tools. We've learned from our competition's mistakes to bring you the quality product you deserve. We've also learned during our off-road testing that these engine skid plates help you get over obstacles by preventing your transfer case skid plate from catching on whatever you're driving over. So you not only get added protection and peace of mind, your Jeep will be more capable as well.